Just in case you are wondering Flipboard is a social magazine app for mobile devices. I can subscribe to a variety of feeds and news sources and have up-to-date content presented to me in a beautiful magazine-like, gesture-based interface. Flipboard makes consuming content fun and effortless. I can share articles with my friends via Facebook and Twitter. I can comment on articles. And I can save articles to Pocket to off-line reading later. 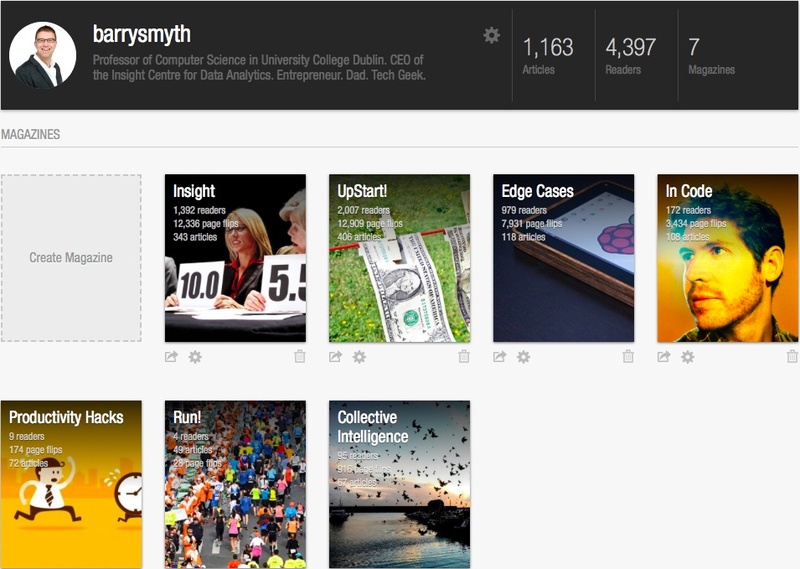 Recently Flipboard have added two new features that have reshaped my usage: curation and a web viewer. Users can now curate their own magazines. For example I curate a magazine called Insight as a place to store (or, flip, in the language of Flipboard) articles related to big data, data analytics, and data science. For me this feature started out as a useful way to archive and categorise articles by topics, from big data to tech startups and from running to coding. Useful enough in its own right. But Flipboard also allows others to subscribe to your (public) magazines from within the Flipboard app. And I was surprised, this weekend, to find that over the last few months that I have attracted almost 5,000 subscribes across a half-dozen magazines, including more than 2,000 subscribers for one magazine. That’s more subscribers than I have Twitter followers! For me this spoke volumes about the maturity of Flipboard’s growing social network. It’s a social network based around an interest graph which reflects t the content consumption habits of millions of users. More recently Flipboard has developed it’s web viewer so that now these magazines can be perused by anyone with a browser — no need for registration and no need for a native app — providing as it does a near native-app user experience. It will be interesting to see how this helps Flipboard grow further especially in the light of recent rumours that Facebook is readying their own Flipboard-compeditor dubbed “Paper”. Yes Flipboard is great. It’s a great way to discover and consume content on a variety pf topics that matter to me while at the same time providing a easy way to curate and share content for others to consume. That said there are a few features that I would love to see Flipboard add. Off-line access would be great . Right now I save a lot of articles to Pocket for off-line reading. Seems to me that Flipboard could do something in this regard, perhaps allowing users to configure which feeds they would like off-line access to. Better social integration and IFTTT support. Flipboard integrates with the usual suspects to support sharing (Facebook, Twitter, Google+, Tumbler, email) but it does not play well with Buffer, which is a real pain, nor does it offer an IFTTT channel which would be great. Magazine analytics. It would be nice to get some simple engagement analytics based from shared magazines; unique users, article popularity, etc. Upstart! – A magazine about startups and starting up in the world of tech. Insight – A magazine about big data and data science. Edges Cases – A magazine about technology, science, and design at the edge of business. This entry was posted in Uncategorized and tagged apps. Bookmark the permalink. ← Building a Better Ski App.